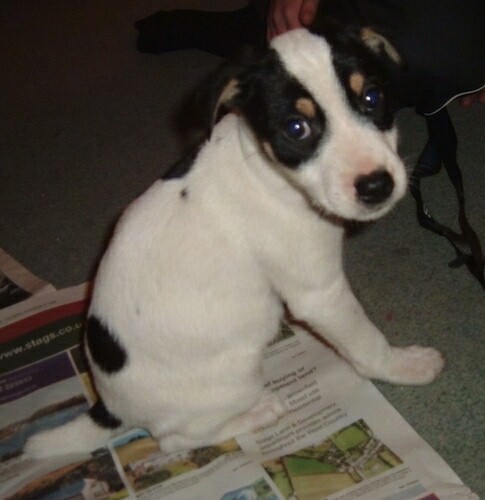 "Frisbbe the Border Jack (Border Collie/Jack Russell) at 6 months hasn't grown much bigger since this picture. He's about 30 pounds. 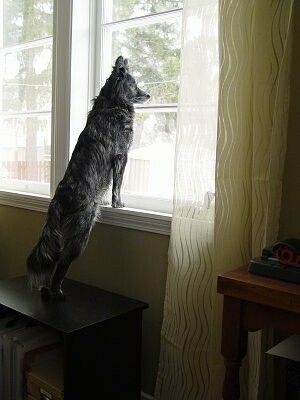 Very smart like Border Collies and Jacks and very hyper as well." The Border Jack is not a purebred dog. It is a cross between the Border Collie and the Jack Russell Terrier. The best way to determine the temperament of a mixed breed is to look up all breeds in the cross and know you can get any combination of any of the characteristics found in either breed. 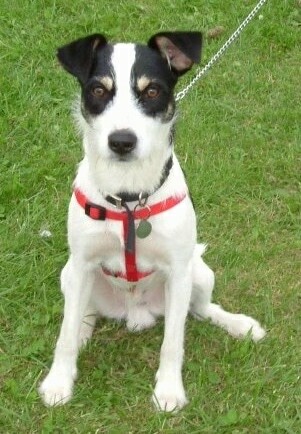 This hybrid is being purposely bred for the sports of agility and flyball. They tend to be very intense, busy dogs that need a lot of activity. Not for novice pet owners, they need activity and a lot of daily exercise. Not all of these designer hybrid dogs being bred are 50% purebred to 50% purebred. It is very common for breeders to breed multi-generation crosses. Taz, a Border Collie / Jack Russell hybrid dog—"This is Taz. He's 18 months old in these pictures. He's very active, playful and very fast. Thinks he's part cat. He's very affectionate when he wants to be and can be standoffish when he's tired. Very alert and curious. Loves to pounce and dig holes. Looks like a little black fox. He's very friendly with other dogs and doesn't mind cats and loves little children. One other thing—he was born deaf. This hasn't been an issue except for we can never let him off his lead. He'll focus on something moving and he's gone. Can't call him back! He's been very good about learning baby sign language and we've discovered he reads lips as well. If he doesn't want to listen, he'll turn his head so he can't see you. We've found he loves the smell of working men but not those in suits that wear cologne or women who wear heavy perfumes. We think it's because his sense of smell is so important to him since he can't hear." "He's definitely a good mix of the two breeds’ traits. Smart and fast and like the Border Collies. Tries to herd other dogs about and cut them off at the pass. He's also determined, willful and busy and has a definite sense of humor like the Jack Russells. We think he's pretty sweet."